Home Assets What is Depreciation and its Types? Depreciation is the reduction in value of a tangible fixed asset due to normal usage, wear and tear, new technology or unfavourable market conditions. Unlike amortization which does not have any subtypes, there are different types of depreciation methods. Assets such as plants and machinery, buildings, vehicles, etc. which are expected to last more than one year, but not for infinity, are subject to this reduction. It is an allocation of the cost of a fixed asset in each accounting period during its expected time of use. First, among types of depreciation methods is the straight-line method, also known as the Original cost method, Fixed instalment method, and Fixed percentage method. Simplest, most used and popular method of charging depreciation is the straight-line method. An equal amount is allocated in each accounting period. The rate of depreciation is the reciprocal of the estimated useful life of an asset, so, for example, the useful life of an asset is 5 years, the depreciation charged will be 1/5 = 20%. The book value of an asset can be reduced to Zero. A fair evaluation of an asset each year on the balance sheet. Related Topic – What is Accumulated Depreciation? 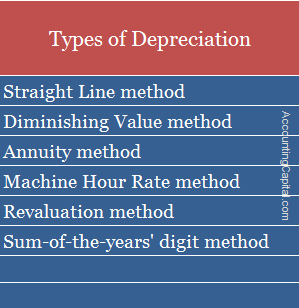 Second, among types of depreciation methods is diminishing value method and is also known as Written down value method, Reducing instalment method and Fixed percentage on diminishing balance. According to the diminishing value method, depreciation is charged on reducing balance & a fixed rate. Depreciation, in this case, is charged over the useful life of an asset over its written down value. The percentage, at which depreciation is charged, remains fixed, however, the amount of depreciation goes on diminishing year after year. More practical and easy to apply. Decreasing charge for depreciation cancels out increasing charges for repairs. This method is applicable for income tax purposes.